There is now quite a lot of Ariel material on the web, but although most of the Ariel story is covered very well, there is very little written about the good stuff early on. Here's a quick "back-date" on the Ariel story before 1910, using bits and pieces gleaned from the old magazines and books. Ariel was one of the pioneer names in the British motorcycle industry, producing De Dion-engined quads and tricycles from the late 1890s. These contraptions were pretty similar to others of the period, although the tricycle seemed to improve on the genuine De Dion article by carrying its motor forward of the rear axle instead of hanging out behind. 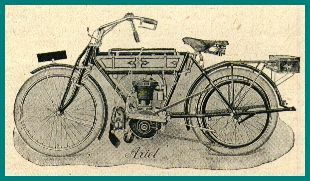 At a show early in 1902 - described in the very first issue of The Motorcycle in February of that year - Ariel displayed the full set of their motor products: the car, the quad, the tricycle and the 1 1/2 h.p. 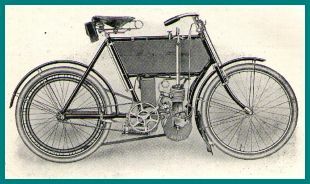 Ariel motor bicycle. This machine, like so many others from manufacturers around the world, was based on the Minerva "kit", which at that time provided an atmospheric inlet valve motor, clipped on below the front frame tube and fed by a surface carburettor inside the fuel tank. The tank was finished in silver with black lines. In the absence of an illustration we can assume that it looked much like other Minerva-engined machines of the day such as the contemporary Bradbury. The earliest Ariel motorcycle illustration I could find comes from an advertisement in the sixth edition (1903) Motor Cycles and How to Manage Them. Clearly this is a primitive machine, still fitted with a surface carburettor, atmospheric inlet valve and coil ignition. I have read that Ariel used Kerry motors for their first two-wheeler, but I couldn't be certain where this power unit comes from, except to say that it is clearly not Minerva. In any event, this model didn't last very long before being replaced by a new, rather strange design. The 1904 model carried its valves across the rear of the cylinder, with the transverse camshaft driven by skew gears and a shaft running at 10 o'clock from the crank. Certainly easy to recognise! If anyone has one, I can put them in touch with a man with a frame to suit! By mid-1908, the 2 1/2 h.p. Light Weight Ariel shown below was being advertised in The Cycle & Motor Trades' Review. "Specially suited for export", it was fitted with magneto ignition and an interesting sprung front fork. 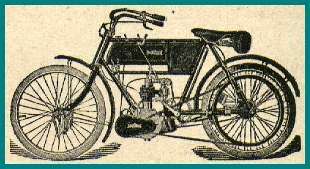 The 1910 model (again advertised in The Cycle & Motor Trades' Review and still "specially suited for export") was now rated at 3 1/2 h.p. and was fitted with the Ariel Patent Variable Speed Gear and Free Engine. The motor looks to be from White and Poppe, used into the mid 1920s. The Druid fork at the front and the elaborate saddle springing (a long-running Ariel feature) must have given a reasonable degree of comfort. By now, the Ariel was looking kind-of modern. There are quite a few "famous" early Ariels in the UK. Arguably the most original is the c1904 model discovered many years ago by Tony Twycross and road tested so admirably by Titch Allen in The First Vintage Road Test Journal. This machine is a real gem. No doubt purists will have noted that it is fitted with Druid front forks that weren't available until around 1907, but Druid advertisements around that time concentrated on selling them as an after-market fitment to early rigid machines. Presumably this bike picked up its Druids some time around then. A similar model, but in dazzling restored condition, attracts a lot of attention at rallies in the UK. Apparently the owner of the rusty remains of a Peugeot-engined pioneer was suitably impressed, and had his machine professionally restored as an "Ariel" as chronicled in Old Bike (Issue 7, 1993). This machine was advertised for sale in 1998 for £25,000. As an Ariel of course. Also in Old Bike (Issue 27, 1998) is the story of the Ariel Owners Motor Cycle Club's own veteran Ariel. Photos of this machine appear in numerous older publications about vintage bikes, as it was a survivor kept safe by the Ariel company for many years. Although usually dated c1903, Reg Eyre's dating of 1908 seems pretty much spot on, as most aspects of the machine are identical to the 1908 model pictured above. The Bodleian Library at Oxford University has a number of illustrations from early Ariel catalogues on the web - see my links page. Ariel went on to make some pretty fine machines, using a range of motors (from White and Poppe, Abingdon, MAG, JAP, Blackburne and probably others) before consolidating with their own in the late 1920s. Their singles and post-war twins were pretty conventional, but the Square Four was a genuinely original contribution to motorcycling. Thanks to early-Ariel devotee Dave Plant for alerting me to the reference to the Ariel-Minerva in 1902.